Growing an event series from scratch on LinkedIn with ZERO paid media budget sounds totally crazy, right? This case study proves it isn't. Kicking off our first episode of "Event Marketing on LinkedIn," we interviewed Tim Queen, inbound marketing strategist and self-made founder and creator of VIVID TALKS. We're taking a deep dive into how Tim uses LinkedIn as his go-to channel for growing his monthly networking event series and how he grows his LinkedIn following every day— to the 28,107 followers it has today. In short, VIVID TALKS is a monthly event series for founders, marketers and inspiring people from all walks of business and life. To give you some background on the intended audience, Tim's event series brings together small & medium-sized business owners from, Human Resources, Sales, and Marketing professionals. Tim launched his event from scratch. From the perspective of an event professional, his chances for success where pretty slim. Do you agree? And last, he also had no f*cking idea how to run events. Back in August 2017, Tim first started taking LinkedIn more seriously. It was the year when LinkedIn increased its footprint in social mediaby launching native video, opening up their publishing platform, and launching algorithms that prioritized native content over shared external content. "When I've read an article that LinkedIn was finally going head to head with the other publishing platforms like Facebook & Medium, I realized that I need to check it out in more detail." It was time to run his experiment. "What if I published my articles on LinkedIn natively, instead of my own blog? What if I only focused on LinkedIn and show up daily to share my thoughts. " After doing exactly that, Tim saw a spike in engagement and decided to pay more attention to the platform he once thought was a 'glorified recruitment platform'. Just by being genuinly helpful and consistent with posting relevant content on LinkedIn. In fact, Tim started posting to LinkedIn on a daily basis. Not only did he focus on LinkedIn specific tips & tricks, he also shared his expertise on digital marketing & sales (experience he built up throughout his career). "Educating people about LinkedIn was a no-brainer, since I spent almost every day publishing on the platform and I learned so much in the process." Tim never stopped adding value and, in fact, he never shared anything promotional on LinkedIn. Instead, he grew his audience organically by sharing expertise, actionable tips, insights & observations first before asking for anything in return. Instead of running paid ads, promoting an event website, or writing cold emails to people he thought would like VIVID TALKS, Tim pulled people in from his existing network that he had grown over the previous months. Tim's engagement and love for the platform didn't go unnoticed, when Jeff Weiner (CEO of LinkedIn), shared two of Tim's post on #LinkedIn Cheat Sheets. His engagement metrics went absolutely berserk. Some of his posts received more than 10,900 likes. Below is a snapshot of his most popular engagement metrics within one year. Looking at his engagement on LinkedIn, would anyone ever say again that LinkedIn's dead? And Tim continued to produce and distribute content throughout the year. "Wait a minute", you're probably asking yourself, " If you already have a such a huge following on LinkedIn getting people to your event must be easy, right? Initially, Tim thought it was a clever move to bring people from LinkedIn together and #InRealLife. 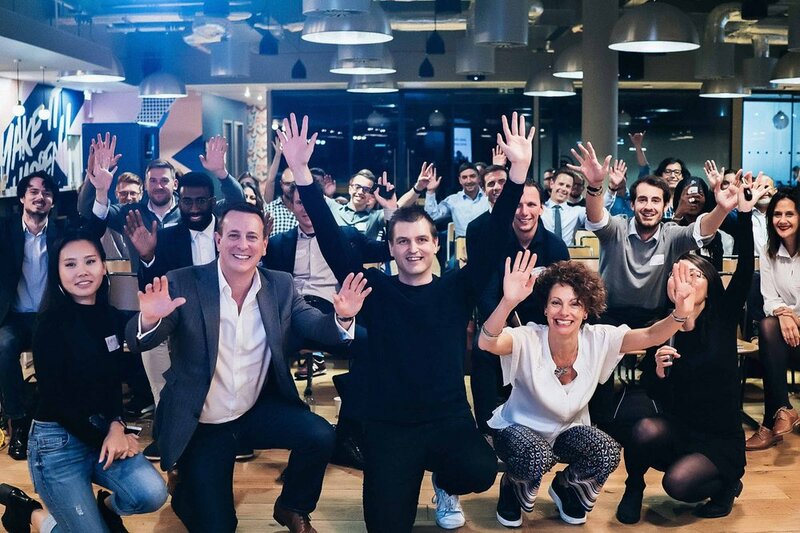 What started off as a meet-up in a London pub became a real event (y'a know with presentations & stuff) with speakers, sponsors, venues & awesome networking. First, he decided on the target audience based on the people already in his network and the topics they're passionate about. Mix that up with the topics Tim likes to speak and learn about and voila. Houston, we have event market fit! When it came to logistics, it was no surprise that Tim also used LinkedIn to source his speakers & his go-to-guy for all things Event AV. Capture a casual interview with one of your speakers and give away bite-sized snippets. As Tim says in the video, there is a problem with speakers that look good on paper. They might have the most amazing CV and industry knowledge, but they might be the most horrendous speaker on stage. But 90% of how you are on video reflect how you will be on stage. And having a video with one of your speakers pre-event, gives people a clear feeling if it's worthwhile attending or not. Maybe it's time for you to rethink your LinkedIn video strategy? Not everyone in your team wants to be on social media and not everyone is using LinkedIn for personal brand building. The goal is to identify the team members who are really active on LinkedIn and see if they can share the event with their audiences. Show the benefits for the audience "What's in it for them?" LinkedIn says, that Company Page videos are five times more likely than other types of content to start a conversation among LinkedIn members. (Remember, we're not talking about sponsored native videos, which is another addition to the platform allowing marketers to use video across all stages of the funnel from brand awareness, to lead generation and CTAs). "My number #1 marketing strategy for promoting VIVID TALKS on LinkedIn is using native LinkedIn videos. I use a mix of event recap videos and photos to thank everyone in our team, speakers, special guests and audience members I spoke to after each event. After each post, many new people join the waiting list for future events. "To promote upcoming events, I create two types of videos. Type one, I warm up the audience with educational videos around the theme of the forthcoming event. Type two, I create more videos in collaboration with members of our team, speakers and panel guests to educate about the upcoming topic and to tease the value of attending. For example: Who is this for? Who will benefit from this? What will people learn? How will this help them?" It's too easy to send people from LinkedIn straight to the event website or registration page. It's almost as ineffective as trying to sell coffee to a Starbucks employee. Did you ever get a personal message on LinkedIn inviting you to this badass marketing conference with ticket prices just being 1,000 USD per pop? It's like going straight into a sales pitch without building any kind of relationship first. But where do you start and what do you do instead? The secret consists of two parts, says Tim. "First, you need to create a great LinkedIn content strategyaround your event that starts from an educational angle to segment and qualify potential attendees and then transitions from understanding a subject to desiring "the missing piece" that will be shared at the event." Interestingly, Tim also says that since 2018, he doesn't rely solely on LinkedIn or in fact any other social network. Tim use LinkedIn to build genuine connections and relationships and top-of-the-funnel awareness content, but then focuses on building out his email list too. Building an email list in addition to your LinkedIn content is the only reliable and future-proof way to communicate with delegates. Just because you hired the best social media marketing person doesn't mean she or he will be efficient on LinkedIn. Instead of using marketing fluff and sales talk, stay very human. How would you explain the event to your mother or to a friend. Make it more practical and really down to earth. Start small: If you haven't been active on LinkedIn, start small. You don't need to go all in like Tim did. Spend some time on optimizing your LinkedIn profile. Engage on other people's post and share the real you. Is your target audience actually on Linkedin? If not, don't bother. Using LinkedIn effectively as a tool to market your event depends on your audience. It works great for B2B events targeted at marketers & sales professionals, media brands, human resources professionals and digital influencers. Share actually tips & advice your audience will find helpful. Drop the sales lingo. Be authentic, approachable and most importantly, yourself. How would you explain your event to a friend? Involve your speakers in video - it will give your attendees a feel for the type of presentation or keynote they're about to hear and eradicate any doubts or disappointments about the quality of the presentation. 90% of what you see in videos you can expect in real life. Showcase event vibes, speakers, team members, behind the scene footage so that it almost fields like you're meeting your family and friends in real life. Until meeting the person at the check-in feels like you're meeting an old friend.